Buy together & SAVE 50% ON AR-10000 Arctic Pure® Primary Water Filter ! Provide your guests with all of the ice they need by installing a Manitowoc SPA-160 vending ice dispenser in your hotel, motel or resort. This floor model ice dispenser can be paired with a 22-inch Manitowoc ice maker. It holds up to 120 pounds of ice and is ideal for filling in-room ice buckets. The Manitowoc SPA-160 Vending Ice Dispenser is ideal for use in hotels, motels, and resorts, as it can hold up to 120 lbs of full-size and half-size ice cubes. This 22"-wide unit features a DuraTech stainless steel exterior for corrosion resistance and easy cleaning. It also includes a patented push-for-ice dispenser mechanism that reduces spillage. Only 22” (55.88 cm) wide, 31” (78.7 cm) deep, and 75.5” high (191.77 cm). 120 lbs. (54.4 kgs.) ice storage capacity. 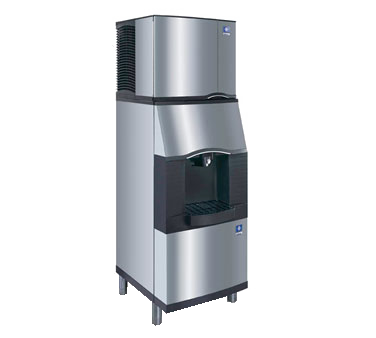 Accepts 22” (55.88 cm) wide Manitowoc ice machine. DuraTech™ exterior provides superior corrosion resistance. Stainless finish with innovative clear-coat resists fingerprints and dirt. Designed for “large” container ice filling. Accepts up to 10.5" (26.67 cm) high container with Built-in water valve. Designed for ice bucket filling in hotels, motels, and resorts Ice only dispense, with coin-op and room card dispensing control options. I have the SPA-160 model and need to know where and how to adjust for smaller cubes or flakes plz help! How do i adjust for smaller size cubes or flakes. Right now its big cubes i want them smaller or flakes and have no idea how to do it. Plz tell me!